Cyprus ( i/ˈsaɪprəs/; Greek: Κύπρος [ˈcipros]; Turkish: Kıbrıs [ˈkɯbɾɯs]), officially the Republic of Cyprus (Greek: Κυπριακή Δημοκρατία; Turkish: Kıbrıs Cumhuriyeti), is an island country in the Eastern Mediterranean Sea. [e] Cyprus is the third largest and third most populous island in the Mediterranean, and a member state of the European Union. It is located south of Turkey, west of Syria and Lebanon, northwest of Israel and the Gaza Strip, north of Egypt and east of Greece. Cyprus was placed under British administration in 1878 and formally annexed by Britain in 1914. The partition of Cyprus and creation of a Turkish state in the north became a policy of Turkish Cypriot leaders and Turkey in the 1950s. Turkish leaders for a period advocated the annexation of Cyprus to Turkey as Cyprus was considered an "extension of Anatolia" by them; while since the 19th century, the majority Greek Cypriot population and its Orthodox church had been pursuing union with Greece, which became a Greek national policy in the 1950s. 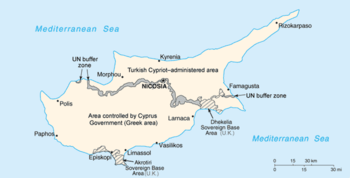 Following nationalist violence in the 1950s, Cyprus was granted independence in 1960. In 1963, the 11-year intercommunal violence between Greek Cypriots and Turkish Cypriots started, which displaced more than 25,000 Turkish Cypriots and brought the end of Turkish Cypriot representation in the republic. On 15 July 1974, a coup d'état was staged by Greek Cypriot nationalists and elements of the Greek military junta in an attempt at enosis, the incorporation of Cyprus into Greece. This action precipitated the Turkish invasion of Cyprus, which led to the capture of the present-day territory of Northern Cyprus the following month, after a ceasefire collapsed, and the displacement of over 150,000 Greek Cypriots and 50,000 Turkish Cypriots. A separate Turkish Cypriot state in the north was established in 1983. These events and the resulting political situation are matters of a continuing dispute. Cyprus, more specifically the seashore at Paphos, was also one of the birthplaces given in Greek mythology for Aphrodite, who was known as Kýpria. This was because Astarte, goddess of love and beauty in Phoenician mythology, for whom Cyprus was an important cult centre, was later identified with Aphrodite. Remains of an 8-month-old cat were discovered buried with a human body at a separate Neolithic site in Cyprus. The grave is estimated to be 9,500 years old (7500 BC), predating ancient Egyptian civilization and pushing back the earliest known feline-human association significantly. The remarkably well-preserved Neolithic village of Khirokitia is a UNESCO World Heritage Site dating to approximately 6800 BC. Cyprus is at a strategic location in the Middle East. It was ruled by Assyria for a century starting in 708 BC, before a brief spell under Egyptian rule and eventually Persian rule in 545 BC. 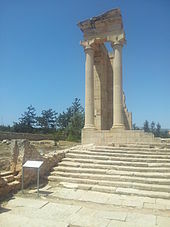 The Cypriots, led by Onesilus, king of Salamis, joined their fellow Greeks in the Ionian cities during the unsuccessful Ionian Revolt in 499 BC against the Achaemenid Empire. The revolt was suppressed, but Cyprus managed to maintain a high degree of autonomy and remained oriented towards the Greek world. Beginning in 649, Cyprus suffered from devastating raids launched by Muslim armies from the Levant, which continued for the next 300 years. Many were quick piratical raids, but others were large-scale attacks in which many Cypriots were slaughtered and great wealth carried off or destroyed. In 1191, during the Third Crusade, Richard I of England captured the island from Isaac Komnenos of Cyprus He used it as a major supply base that was relatively safe from the Saracens. A year later Richard sold the island to the Knights Templar, who, following a bloody revolt, in turn sold it to Guy of Lusignan. His brother and successor Amalric was recognized as King of Cyprus by Henry VI, Holy Roman Emperor. Following the death in 1473 of James II, the last Lusignan king, the Republic of Venice assumed control of the island, while the late king's Venetian widow, Queen Catherine Cornaro, reigned as figurehead. Venice formally annexed Cyprus in 1489, following the abdication of Catherine. The Venetians fortified Nicosia by building the Venetian Walls, and used it as an important commercial hub. Throughout Venetian rule, the Ottoman Empire frequently raided Cyprus. In 1539 the Ottomans destroyed Limassol and so fearing the worst, the Venetians also fortified Famagusta and Kyrenia. During the almost four centuries of Latin rule, there existed two societies on Cyprus. The first consisted of Frankish nobles and their retinue, as well as Italian merchants and their families. The second, the majority of the population, consisted of Greek Cypriots, serfs and labourers. Although a determined effort was made to supplant native traditions and culture, the effort failed. As soon as the Greek War of Independence broke out in 1821, several Greek Cypriots left for Greece to join the Greek forces. In response, the Ottoman governor of Cyprus arrested and executed 486 prominent Greek Cypriots, including the Archbishop of Cyprus, Kyprianos and four other bishops. 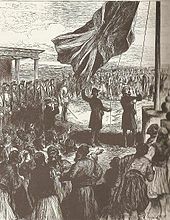 In 1828, modern Greece's first president Ioannis Kapodistrias called for union of Cyprus with Greece, and numerous minor uprisings took place. Reaction to Ottoman misrule led to uprisings by both Greek and Turkish Cypriots, although none were successful. Centuries of neglect by the Turks, the unrelenting poverty of most of the people, and the ever-present tax collectors fuelled Greek nationalism, and by the 20th century the idea of enosis, or union, with newly independent Greece was firmly rooted among Greek Cypriots. In 1915, Britain offered Cyprus to Constantine I of Greece on condition that Greece join the war on the side of the British, which he declined. In 1923, under the Treaty of Lausanne, the nascent Turkish republic relinquished any claim to Cyprus, and in 1925 it was declared a British crown colony. Many Greek and Turkish Cypriots fought in the British Army during both world wars. [not in citation given] During the Second World War, many enlisted in the Cyprus Regiment. 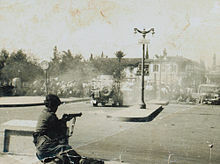 British soldiers fighting against a street riot by EOKA in Nicosia, 1956. Initially, the Turkish Cypriots favoured the continuation of the British rule. However, they were alarmed by the Greek Cypriot calls for enosis as they saw the union of Crete with Greece, which led to the exodus of Cretan Turks, as a precedent to be avoided, and they took a pro-partition stance in response to the militant activity of EOKA. The Turkish Cypriots also viewed themselves as a distinct ethnic group of the island and believed in their having a separate right to self-determination from Greek Cypriots. Meanwhile, in the 1950s, Turkish leader Menderes considered Cyprus an "extension of Anatolia", rejected the partition of Cyprus along ethnic lines and favoured the annexation of the whole island to Turkey. Nationalistic slogans centered on the idea that "Cyprus is Turkish" and the ruling party declared Cyprus to be a part of the Turkish homeland that was vital to its security. Upon realising the fact that the Turkish Cypriot population was only 20% of the islanders made annexation unfeasible, the national policy was changed to favour partition. The slogan "Partition or Death" was frequently used in Turkish Cypriot and Turkish protests starting in the late 1950s and continuing throughout the 1960s. Although after the Zurich and London conferences Turkey seemed to accept the existence of the Cypriot state and to distance itself from its policy of favouring the partition of the island, the goal of the Turkish and Turkish Cypriot leaders remained that of creating an independent Turkish state in the northern part of the island. In January 1950, the Church of Cyprus organised a referendum under the supervision of clerics and with no Turkish Cypriot participation, where 96% of the participating Greek Cypriots voted in favour of enosis, The Greeks were 80.2% of the total island' s population at the time (census 1946). Restricted autonomy under a constitution was proposed by the British administration but eventually rejected. In 1955 the EOKA organisation was founded, seeking union with Greece through armed struggle. At the same time the Turkish Resistance Organisation (TMT), calling for Taksim, or partition, was established by the Turkish Cypriots as a counterweight. The British had also adopted at the time a policy of "divide and rule". Woodhouse, a British official in Cyprus, revealed that then British Foreign Secretary Harold Macmillan "urged the Britons in Cyprus to stir up the Turks in order to neutralise Greek agitation". British officials also tolerated the creation of the Turkish underground organisation T.M.T. The Secretary of State for the Colonies in a letter dated 15 July 1958 had advised the Governor of Cyprus not to act against T.M.T despite its illegal actions so as not to harm British relations with the Turkish government. On 16 August 1960, Cyprus attained independence after the Zürich and London Agreement between the United Kingdom, Greece and Turkey. Cyprus had a total population of 573,566; of whom 442,138 (77.1%) were Greeks, 104,320 (18.2%) Turks, and 27,108 (4.7%) others  The UK retained the two Sovereign Base Areas of Akrotiri and Dhekelia, while government posts and public offices were allocated by ethnic quotas, giving the minority Turkish Cypriots a permanent veto, 30% in parliament and administration, and granting the three mother-states guarantor rights. However, the division of power as foreseen by the constitution soon resulted in legal impasses and discontent on both sides, and nationalist militants started training again, with the military support of Greece and Turkey respectively. The Greek Cypriot leadership believed that the rights given to Turkish Cypriots under the 1960 constitution were too extensive and designed the Akritas plan, which was aimed at reforming the constitution in favor of Greek Cypriots, persuading the international community about the correctness of the changes and violently subjugating Turkish Cypriots in a few days should they not accept the plan. Tensions were heightened when Cypriot President Archbishop Makarios III called for constitutional changes, which were rejected by Turkey and opposed by Turkish Cypriots. Intercommunal violence erupted on December 21, 1963, when two Turkish Cypriots were killed at an incident involving the Greek Cypriot police. The violence resulted in the death of 364 Turkish and 174 Greek Cypriots, destruction of 109 Turkish Cypriot or mixed villages and displacement of 25,000-30,000 Turkish Cypriots. The crisis resulted in the end of the Turkish Cypriot involvement in the administration and their claiming that it had lost its legitimacy; the nature of this event is still controversial. In some areas, Greek Cypriots prevented Turkish Cypriots from travelling and entering government buildings, while some Turkish Cypriots willingly withdrew due to the calls of the Turkish Cypriot administration. Turkish Cypriots started living in enclaves; the republic's structure was changed unilaterally by Makarios and Nicosia was divided by the Green Line, with the deployment of UNFICYP troops. In 1964, Turkey tried to invade Cyprus in response to the continuing Cypriot intercommunal violence. But Turkey was stopped by a strongly worded telegram from the US President Lyndon B. Johnson on 5 June, warning that the US would not stand beside Turkey in case of a consequential Soviet invasion of Turkish territory. Meanwhile, by 1964, enosis was a Greek policy that could not be abandoned; Makarios and the Greek prime minister Georgios Papandreou agreed that enosis should be the ultimate aim and King Constantine wished Cyprus "a speedy union with the mother country". Greece dispatched 10,000 troops to Cyprus to counter a possible Turkish invasion. The Turkish air force began bombing Greek positions on Cyprus, and hundreds of paratroops were dropped in the area between Nicosia and Kyrenia, where well-armed Turkish Cypriot enclaves had been long-established; while off the Kyrenia coast, Turkish troop ships landed 6,000 men as well as tanks, trucks and armoured vehicles. Three days later, when a ceasefire had been agreed, Turkey had landed 30,000 troops on the island and captured Kyrenia, the corridor linking Kyrenia to Nicosia, and Turkish Cypriot quarter of Nicosia itself. The junta in Athens, and then the Sampson regime in Cyprus fell from power. In Nicosia, Glafkos Clerides assumed the presidency and constitutional order was restored, removing the pretext for the Turkish invasion. But during the peace negotiations in Geneva, the Turkish government reinforced their Kyrenia bridgehead and prepared for a second invasion. The invasion began on 14 August and resulted in the seizure of Morphou, Karpass, Famagusta and the Mesaoria. International pressure led to a ceasefire, and by then 37% of the island had been taken over by the Turks and 180,000 Greek Cypriots had been evicted from their homes in the north. At the same time, around 50,000 Turkish Cypriots moved to the areas under the control of the Turkish Forces and settled in the properties of the displaced Greek Cypriots. Among a variety of sanctions against Turkey, in mid-1975 the US Congress imposed an arms embargo on Turkey for using American-supplied equipment during the Turkish invasion of Cyprus in 1974. There are 1,534 Greek Cypriots and 502 Turkish Cypriots missing as a result of the fighting. The events of the summer of 1974 dominate the politics on the island, as well as Greco-Turkish relations. Around 150,000 settlers from Turkey are believed to be living in the north—many of whom were forced from Turkey by the Turkish government—in violation of the Geneva Convention and various UN resolutions. Following the invasion and the capture of its northern territory by Turkish troops, the Republic of Cyprus announced that all of its ports of entry in the north were closed, as they were effectively not under its control. The Turkish invasion, followed by occupation and the declaration of independence of the TRNC have been condemned by United Nations resolutions, which are reaffirmed by the Security Council every year. The last major effort to settle the Cyprus dispute was the Annan Plan in 2004, drafted by the then Secretary General, Kofi Annan. The plan was put to a referendum in both Northern Cyprus and the Republic of Cyprus. 65% of Turkish Cypriots voted in support of the plan and 74% Greek Cypriots voted against the plan, claiming that it disproportionately favoured the Turkish side. In total, 66.7% of the voters rejected the Annan Plan V. On 1 May 2004 Cyprus joined the European Union, together with nine other countries. Cyprus was accepted into the EU as a whole, although the EU legislation is suspended in the territory occupied by Turkey (TRNC), until a final settlement of the Cyprus problem. In July 2006, the island served as a haven for people fleeing Lebanon, due to the conflict between Israel and Hezbollah (also called "The July War"). In March 2008, a wall that had stood for decades at the boundary between the Republic of Cyprus and the UN buffer zone was demolished. The wall had cut across Ledra Street in the heart of Nicosia and was seen as a strong symbol of the island's 32-year division. On 3 April 2008, Ledra Street was reopened in the presence of Greek and Turkish Cypriot officials. North and South relaunched reunification talks on 15 May 2015. Cyprus is the third largest island in the Mediterranean Sea, after the Italian islands of Sicily and Sardinia (both in terms of area and population). It is also the world's 81st largest by area and world's 51st largest by population. It measures 240 kilometres (149 mi) long from end to end and 100 kilometres (62 mi) wide at its widest point, with Turkey 75 kilometres (47 mi) to the north. It lies between latitudes 34° and 36° N, and longitudes 32° and 35° E.
Other neighbouring territories include Syria and Lebanon to the east (105 and 108 kilometres (65 and 67 mi), respectively), Israel 200 kilometres (124 mi) to the southeast, Egypt 380 kilometres (236 mi) to the south, and Greece to the northwest: 280 kilometres (174 mi) to the small Dodecanesian island of Kastellorizo (Megisti), 400 kilometres (249 mi) to Rhodes and 800 kilometres (497 mi) to the Greek mainland. Among all cities in the Mediterranean part of the European Union, Limassol has one of the warmest winters, in the period January – February average temperature is 17–18 °C (63–64 °F) during the day and 8–9 °C (46–48 °F) at night, in other coastal locations in Cyprus is generally 16–17 °C (61–63 °F) during the day and 7–9 °C (45–48 °F) at night. In March and December in Limassol average temperatures is 19–20 °C (66–68 °F) during the day and 10–11 °C (50–52 °F) at night, in other coastal locations in Cyprus is generally 17–19 °C (63–66 °F) during the day and 8–11 °C (46–52 °F) at night. The middle of summer is hot – in July and August on the coast the average temperature is usually around 33 °C (91 °F) during the day and around 23 °C (73 °F) at night (inside the island, in the highlands average temperature exceeds 35 °C (95 °F)) while in the June and September on the coast the average temperature is usually around 30 °C (86 °F) during the day and around 20 °C (68 °F) at night. Large fluctuations in temperature are rare. Temperatures inside the island are more stringent, with colder winters and more hot summers compared with the coast of the island. Sunshine hours on the coast are around 3,400 per year, from an average of 5–6 hours of sunshine per day in December to an average of 12–13 hours in July. This is about double that of cities in the northern half of Europe; for comparison, London receives about 1,461 per year. In December, London receives about 37 hours of sunshine while coastal locations in Cyprus about 180 hours (that is, as much as in May in London). Turkey is building a water pipeline under the Mediterranean Sea from Anamur on its southern coast to the northern coast of Cyprus, to supply Northern Cyprus with potable and irrigation water (see Northern Cyprus Water Supply Project). The House of Representatives currently has 59 members elected for a five-year term, 56 members by proportional representation and 3 observer members representing the Armenian, Latin and Maronite minorities. 24 seats are allocated to the Turkish community but remain vacant since 1964. The political environment is dominated by the communist AKEL, the liberal conservative Democratic Rally, the centrist Democratic Party, the social-democratic EDEK and the centrist EURO.KO. In 2008, Dimitris Christofias became the country's first Communist head of state. Due to his involvement in the 2012–13 Cypriot financial crisis, Christofias did not run for re-election in 2013. The Presidential election in 2013 resulted in Democratic Rally candidate Nicos Anastasiades winning 57.48% of the vote. 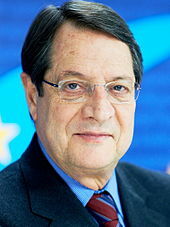 As a result, Anastasiades was sworn in on and has been President since 28 February 2013. In 2014, Turkey was ordered by the European Court of Human Rights to pay well over $100m in compensation to Cyprus for the invasion; Ankara announced that it would ignore the judgment. In 2014, a group of Cypriot refugees and a European parliamentarian, later joined by the Cypriot government, filed a complaint to the International Court of Justice, accusing Turkey of violating the Geneva Conventions by directly or indirectly transferring its civilian population into occupied territory. Over the preceding ten years, civilian transfer by Turkey had "reached new heights", in the words of one U.S. ambassador. [f] Other violations of the Geneva and the Hague Conventions—both ratified by Turkey—amount to what archaeologist Sophocles Hadjisavvas called "the organized destruction of Greek and Christian heritage in the north". These violations include looting of cultural treasures, deliberate destruction of churches, neglect of works of art, and altering the names of important historical sites, which was condemned by the International Council on Monuments and Sites. Hadjisavvas has asserted that these actions are motivated by a Turkish policy of erasing the Greek presence in Northern Cyprus within a framework of ethnic cleansing, as well as by greed and profit-seeking on the part of the individuals involved. Soldiers of the Cypriot National Guard marching in Rome. The air force includes the 449th Helicopter Gunship Squadron (449 ΜΑΕ) – operating SA-342L and Bell 206 and the 450th Helicopter Gunship Squadron (450 ME/P) – operating Mi-35P, BN-2B and PC-9. Current Senior officers include Supreme Commander, Cypriot National Guard, Lt. General Stylianos Nasis, and Chief of Staff, Cypriot National Guard: Maj. General Michalis Flerianos. The Evangelos Florakis Naval Base explosion, which occurred on 11 July 2011, was the most deadly military accident ever recorded in Cyprus. 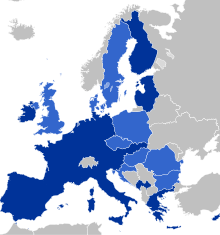 Cyprus is part of a monetary union, the eurozone (dark blue), and of the EU single market. According to the latest International Monetary Fund estimates, its per capita GDP (adjusted for purchasing power) at $30,769 is just above the average of the European Union. Cyprus has been sought as a base for several offshore businesses for its low tax rates. Tourism, financial services and shipping are significant parts of the economy. Economic policy of the Cyprus government has focused on meeting the criteria for admission to the European Union. 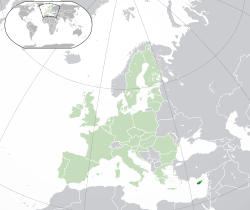 The Cypriot government adopted the euro as the national currency on 1 January 2008. In recent years significant quantities of offshore natural gas have been discovered in the area known as Aphrodite in Cyprus' exclusive economic zone (EEZ), about 175 kilometres (109 miles) south of Limassol at 33°5′40″N and 32°59′0″E. However, Turkey's offshore drilling companies have accessed both natural gas and oil resources since 2013. Cyprus demarcated its maritime border with Egypt in 2003, and with Lebanon in 2007. 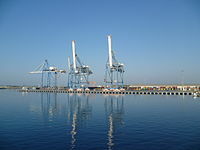 Cyprus and Israel demarcated their maritime border in 2010, and in August 2011, the US-based firm Noble Energy entered into a production-sharing agreement with the Cypriot government regarding the block's commercial development. Turkey, which does not recognize the border agreements of Cyprus with its neighbours, threatened to mobilize its naval forces if Cyprus proceeded with plans to begin drilling at Block 12. Cyprus' drilling efforts have the support of the US, EU, and UN, and on 19 September 2011 drilling in Block 12 began without any incidents being reported. Population growth (numbers for the entire island, excluding Turkish settlers residing in Northern Cyprus). 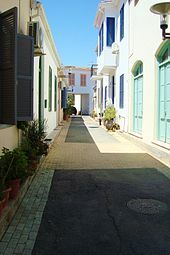 The villages of Potamia (Nicosia district) and Pyla in the Larnaca District are the only settlements in the Republic of Cyprus with a mixed Greek and Turkish Cypriot population. The majority of Greek Cypriots identify as Greek Orthodox, whereas most Turkish Cypriots are adherents of Sunni Islam. According to Eurobarometer 2005, Cyprus is the second most religious state in the European Union, after Malta (see Religion in the European Union). 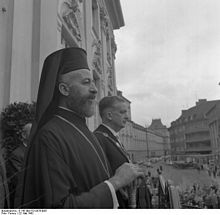 The first President of Cyprus, Makarios III, was an archbishop. The current leader of the Greek Orthodox Church of Cyprus is Archbishop Chrysostomos II. According to the 2001 census carried out in the Government-controlled area, 94.8% of the population are Eastern Orthodox, 0.9% Armenians and Maronites, 1.5% Roman Catholics, 1.0% Church of England, and 0.6% Muslims. The remaining 1.3% adhere to other religious denominations or did not state their religion. Cyprus has two official languages, Greek and Turkish. Armenian and Cypriot Maronite Arabic are recognized as minority languages. Although without official status, English is widely spoken and it features widely on road signs, public notices, and in advertisements, etc. English was the sole official language during British colonial rule and the lingua franca until 1960, and continued to be used (de facto) in courts of law until 1989 and in legislation until 1996. 80.4% of Cypriots are proficient in the English language as a second language. Russian is widely spoken among the country's minorities, residents and citizens of post-Soviet countries, and Pontic Greeks. Russian, after English and Greek, is the third language used on many signs of shops and restaurants, particularly in Limassol and Paphos. In addition to these languages, 12% speak French and 5% speak German. The traditional folk music of Cyprus has several common elements with Greek, Turkish, and Arabic music including Greco-Turkish dances such as the sousta, syrtos, zeibekikos, tatsia, and karsilamas as well as the Middle Eastern-inspired tsifteteli and arapies. There is also a form of musical poetry known as chattista which is often performed at traditional feasts and celebrations. The instruments commonly associated with Cyprus folk music are the bouzouki, oud ("outi"), violin ("fkiolin"), lute ("laouto"), accordion, Cyprus flute ("pithkiavlin") and percussion (including the "toumperleki"). Composers associated with traditional Cypriot music include Evagoras Karageorgis, Marios Tokas, Solon Michaelides and Savvas Salides. Among musicians is also the acclaimed pianist Cyprien Katsaris. Popular music in Cyprus is generally influenced by the Greek Laïka scene; artists who play in this genre include international platinum star Anna Vissi, Evridiki, and Sarbel. Hip Hop, R&B and reggae have been supported by the emergence of Cypriot rap and the urban music scene at Ayia Napa. Cypriot rock music and Éntekhno rock is often associated with artists such as Michalis Hatzigiannis and Alkinoos Ioannidis. Metal also has a small following in Cyprus represented by bands such as Armageddon (rev.16:16), Blynd, Winter's Verge and Quadraphonic. The most renowned Cypriot director to have worked abroad is Michael Cacoyannis. Cypriot cinema was born much later than that of other countries. In the late 1960s and early 1970s, George Filis produced and directed Gregoris Afxentiou, Etsi Prodothike i Kypros (Cyprus Betrayal), and The Mega Document. In 1994, cinematographic production received a boost with the establishment of the Cinema Advisory Committee. 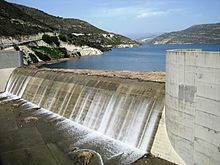 As of the year 2000, the annual amount set aside in the national budget stands at Cy Pounds 500,000 (about 850,000 Euros). In addition to government grants, Cypriot co-productions are eligible for funding from the Council of Europe's Eurimages Fund, which finances European film co-productions. To date, four feature-length films in which a Cypriot was executive producer have received funding from Eurimages. The first was I Sphagi tou Kokora (1992), completed in 1996, Hellados (And the Trains Fly to the Sky, 1995), which is currently in post-production, and Costas Demetriou's O Dromos gia tin Ithaki (The Road to Ithaka, 1997) which premiered in March 2000. The theme song to The Road to Ithaka was composed by Costas Cacoyannis and sung by Alexia Vassiliou. In September 1999, To Tama (The Promise) by Andreas Pantzis also received funding from the Eurimages Fund. In 2009 the Greek director, writer and producer Vassilis Mazomenos filmed in Cyprus Guilt. The film was awarded in 2012 with the Best Screenwriting and Best Photography award in London Greek Film Festival (U.K.) and was official selection in Montreal World Film Festival, Cairo International Film Festival, India International Film Festival, Tallinn Black Nights Film Festival, Fantasporto and opening film in the Panorama of European Cinema in Athens. In 2010 the film was Nominated for the best film from the Hellenic Film Academy. Halloumi cheese originated in Cyprus and was initially made during the Medieval Byzantine period. Halloumi (Hellim) is commonly served sliced, either fresh or grilled, as an appetiser. Seafood and fish dishes include squid, octopus, red mullet, and sea bass. Cucumber and tomato are used widely in salads. Common vegetable preparations include potatoes in olive oil and parsley, pickled cauliflower and beets, asparagus and taro. 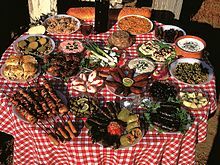 Other traditional delicacies of are meat marinated in dried coriander seeds and wine, and eventually dried and smoked, such as lountza (smoked pork loin), charcoal-grilled lamb, souvlaki (pork and chicken cooked over charcoal), and sheftalia (minced meat wrapped in mesentery). Pourgouri (bulgur, cracked wheat) is the traditional source of carbohydrate other than bread, and is used to make the delicacy koubes. Tennis player Marcos Baghdatis was ranked 8th in the world, was a finalist at the Australian Open, and reached the Wimbledon semi-final, all in 2006. High jumper Kyriakos Ioannou achieved a jump of 2.35 m at the 11th IAAF World Championships in Athletics in Osaka, Japan, in 2007, winning the bronze medal. He has been ranked third in the world. In motorsports, Tio Ellinas is a successful race car driver, currently racing in the GP3 Series for Marussia Manor Motorsport. There is also mixed martial artist Costas Philippou, who competes in the Ultimate Fighting Championship promotion's middleweight division. Costas holds a 6-3 record in UFC bouts, and recently defeated "The Monsoon" Lorenz Larkin with a Knockout in the 1st round. Also notable for a Mediterranean island, the siblings Christopher and Sophia Papamichalopoulou qualified for the 2010 Winter Olympics in Vancouver, Canada. They were the only athletes who managed to qualify and thus represented Cyprus at the 2010 Winter Olympics. ^ Cyprus is approximate to Anatolia (Asia Minor) (which comprises the bulk of Turkey) but it may be considered to be in Asia and/or Europe, which together constitute Eurasia. The UN classification of world regions places Cyprus in Western Asia; National Geographic and numerous other sources place Cyprus in Europe, such as the BBC, the CIA World Factbook and worldatlas; it is also a member state of the European Union. Contrarily, sources may place Cyprus in the Middle East. ^ "National Anthem". Retrieved 3 June 2015. ^ United Nations, Department of Economic and Social Affairs, Population Division (2013). "World Population Prospects: The 2012 Revision, Highlights and Advance Tables (ESA/P/WP.220)" (PDF). New York. p. 52. ^ "Statistical Service – Population and Social Conditions – Population Census – Announcements – Preliminary Results of the Census of Population, 2011" (in Greek). Statistical Service of the Ministry of Finance of the Republic of Cyprus. 29 December 2011. Retrieved 29 January 2012. ^ United Nations, Department of Economic and Social Affairs, Population Division (2013). "World Population Prospects: The 2012 Revision, DB02: Stock Indicators". New York. ^ a b c d "Report for Cyprus". World Economic Outlook Database. International Monetary Fund. Retrieved 17 April 2013. ^ "2013 Human Development Report". United Nations Publications. 14 March 2013. Retrieved 14 March 2013. ^ "United Nations Statistics Division- Standard Country and Area Codes Classifications (M49)". United. UNSD. Retrieved 20 May 2015. ^ "MapMaker 1-Page Maps - National Geographic Education". National Geographic. Retrieved 20 May 2015. ^ "BBC News - Cyprus country profile". ^ "Europe map / Map of Europe - Facts, Geography, History of Europe - Worldatlas.com". Retrieved 20 May 2015. ^ a b "Stone Age wells found in Cyprus". BBC News. 25 June 2009. Retrieved 31 July 2009. ^ a b c "Treaty of Lausanne". ^ Faustmann, Hubert; Ker-Lindsay, James (2008). The Government and Politics of Cyprus. Peter Lang. p. 48. ISBN 9783039110964. ^ Mirbagheri, Farid (2009). Historical Dictionary of Cyprus. Scarecrow Press. p. 25. ^ Trimikliniotis, Nicos (2012). Beyond a Divided Cyprus: A State and Society in Transformation. Palgrave Macmillan. p. 104. ISBN 9781137100801. ^ "U.S. Library of Congress – Country Studies – Cyprus – Intercommunal Violence". Countrystudies.us. 21 December 1963. Retrieved 25 October 2009. ^ a b Mallinson, William (2005). Cyprus: A Modern History. I. B. Tauris. p. 81. ISBN 978-1-85043-580-8. ^ "website". BBC News. 4 October 2002. Retrieved 25 October 2009. ^ Constantine Panos Danopoulos; Dhirendra K. Vajpeyi; Amir Bar-Or (2004). Civil-military Relations, Nation Building, and National Identity: Comparative Perspectives. Greenwood Publishing Group. p. 260. ISBN 978-0-275-97923-2. ^ "According to the United Nations Security Council Resolutions 550 and 541". United Nations. Retrieved 27 March 2009. ^ European Consortium for Church-State Research. Conference (2007). Churches and Other Religious Organisations as Legal Persons: Proceedings of the 17th Meeting of the European Consortium for Church and State Research, Höör (Sweden), 17-20 November 2005. Peeters Publishers. p. 50. ISBN 978-90-429-1858-0. There is little data concerning recognition of the 'legal status' of religions in the occupied territories, since any acts of the 'Turkish Republic of Northern Cyprus' are not recognized by either the Republic of Cyprus or the international community. ^ Peter Neville (22 March 2013). Historical Dictionary of British Foreign Policy. Scarecrow Press. p. 293. ISBN 978-0-8108-7371-1. ...Ecevit ordered the army to occupy the Turkish area on 20 July 1974. It became the Republic of Northern Cyprus, but Britain, like the rest of the international community, except Turkey, refused to extend diplomatic recognition to the enclave. British efforts to secure Turkey's removal from its surrogate territory after 1974 failed. ^ Lesley Pender; Richard Sharpley (2005). The Management of Tourism. SAGE. p. 273. ISBN 978-0-7619-4022-7. ^ Richard Sharpley (16 May 2012). Tourism Development and the Environment: Beyond Sustainability?. Routledge. p. 296. ISBN 978-1-136-57330-9. ^ Sharpley, Richard; Telfer, David John (2002). Tourism and Development: Concepts and Issues. Channel View Publications. p. 334. ISBN 978-1-873150-34-4. ^ "World Economic Outlook Database May 2001". International Monetary Fund. Retrieved 28 June 2011. ^ "Country and Lending Groups". World Bank. Retrieved 11 May 2010. ^ "Human Development Index (HDI)–2011 Rankings". United Nations Development Programme. Retrieved 4 November 2011. ^ "The Non-Aligned Movement: Background Information". Non-Aligned Movement. 21 September 2001. Retrieved 19 January 2010. ^ Stuart Swiny, ed. (2001). The Earliest Prehistory of Cyprus: From Colonization to Exploitation (PDF). Boston, MA: American Schools of Oriental Research. ^ Wade, Nicholas (29 June 2007). "Study Traces Cat's Ancestry to Middle East". New York Times. Retrieved 4 October 2012. ^ Walton, Marsha (9 April 2004). "Ancient burial looks like human and pet cat". CNN. Retrieved 23 November 2007. ^ A.D. Lacy. Greek Pottery in the Bronze Age. Taylor & Francis. p. 168. ^ a b c d e f g h i j k l m n o p q r "Library of Congress Country Studies. Cyprus". Lcweb2.loc.gov. Retrieved 1 November 2009. ^ Getzel M Cohen (1995). The Hellenistic Settlements in Europe, the Islands and Asia Minor. University of California Press. p. 35. ISBN 978-0-520-91408-7. ^ Charles Anthony Stewart (2008). Domes of Heaven: The Domed Basilicas of Cyprus. ProQuest. p. 69. ISBN 978-0-549-75556-2. ^ Michael Spilling; Jo-ann Spilling (2010). Cyprus. Marshall Cavendish. p. 23. ISBN 978-0-7614-4855-6. ^ "Eric Solsten, ed. Cyprus: A Country Study. Washington: GPO for the Library of Congress, 1991". Countrystudies.us. Retrieved 16 April 2013. ^ Mallinson, William. "Cyprus a Historical Overview (Chipre Una Visión Historica)" (PDF). Ministry of Foreign Affairs of the Republic of Cyprus website (in Spanish). Retrieved 22 September 2012. ^ a b Ronald Jennings (1 August 1992). Christians and Muslims in Ottoman Cyprus and the Mediterranean World, 1571-1640. NYU Press. pp. 596–. ISBN 978-0-8147-4318-8. ^ Captain A. R. Savile (1878). Cyprus. H.M. Stationery Office. p. 130. ^ Chrysostomos Pericleous (2009). Cyprus Referendum: A Divided Island and the Challenge of the Annan Plan. I.B.Tauris. p. 131. ISBN 978-0-85771-193-9. ^ Mirbagheri, Farid (2010). Historical dictionary of Cyprus ([Online-Ausg.]. ed.). Lanham, Md. [u.a. ]: Scarecrow Press. pp. xxvii, 124. ISBN 9780810862982. ^ William Mallinson, Bill Mallinson (2005). Cyprus: a modern history. I.B.Tauris. p. 10. ISBN 978-1-85043-580-8. ^ Xypolia, Ilia (2011). "'Cypriot Muslims among Ottomans, Turks and British" (PDF). Bogazici Journal 25 (2): 109–120. Retrieved 15 October 2012. ^ Ker-Lindsay, James (2011). The Cyprus Problem: What Everyone Needs to Know. Oxford University Press. pp. 14–5. ISBN 9780199757169. They hoped that the transfer of administration would pave the way for the island to be united with Greece—an aspiration known as “enosis.” At the time, these calls for enosis were not just limited to Cyprus. Instead, Cyprus was part of a wider political movement [...] This overarching political ambition was known as the Megali Idea (Great Idea). ^ Lange, Matthew (2011). Educations in Ethnic Violence: Identity, Educational Bubbles, and Resource Mobilization. Cambridge University Press. p. 88. ISBN 9781139505444. ^ a b Diez, Thomas (2002). The European Union and the Cyprus Conflict: Modern Conflict, Postmodern Union. Manchester University Press. p. 83. ISBN 9780719060793. ^ Papadakis, Yiannis; Peristianis, Nicos; Welz, Gisela (July 18, 2006). Divided Cyprus: Modernity, History, and an Island in Conflict. Indiana University Press. p. 2. ISBN 9780253111913. ^ Isachenko, Daria (2012). The Making of Informal States: Statebuilding in Northern Cyprus and Transdniestria. Palgrave Macmillian. p. 37. ISBN 9780230392076. ^ Pericleous, Chrysostomos (2009). Cyprus Referendum: A Divided Island and the Challenge of the Annan Plan. I.B.Tauris. pp. 135–6. ISBN 9780857711939. ^ Mirbagheri, Farid (2009). Historical Dictionary of Cyprus. Scarecrow Press. p. xiv. ISBN 9780810862982. Greek Cypriots engaged in a military campaign for enosis, union with Greece. Turkish Cypriots, in response, expressed their desire for taksim, partition of the island. ^ a b G. Bellingeri; T. Kappler (2005). Cipro oggi. Casa editrice il Ponte. pp. 27–29. ISBN 978-88-89465-07-3. The educational and political mobilisation between 1948-1958, aiming at raising Turkish national consciousness, resulted in the involving Turkey as motherland in the Cyprus Question. From then on, Turkey, would work hand in hand with the Turkish Cypriot leadership and the British government to oppose the Greek Cypriot demand for Enosis and realise the partition of Cyprus, which meanwhile became the national policy. ^ Grob-Fitzgibbon, Benjamin (2011). Imperial Endgame: Britain's Dirty Wars and the End of Empire. Palgrave Macmillan. p. 285. ISBN 9780230300385. ^ Dale C. Tatum (1 January 2002). Who Influenced Whom? : Lessons from the Cold War. University Press of America. p. 43. ISBN 978-0-7618-2444-2. Retrieved 21 August 2013. ^ Caesar V. Mavratsas. "Politics, Social Memory, and Identity in Greek Cyprus since 1974". cyprus-conflict.net. Retrieved 13 October 2007. ^ "1964: Guns fall silent in Cyprus". BBC News. 24 April 2004. Retrieved 25 October 2009. ^ Mirbagheri, Farid (2014). Cyprus and International Peacemaking 1964-1986. Routledge. p. 28. ISBN 9781136677526. ^ Atkin, Nicholas; Biddiss, Michael; Tallett, Frank. The Wiley-Blackwell Dictionary of Modern European History Since 1789. p. 184. ISBN 9781444390728. ^ Ronen, Yaël (2011). Transition from Illegal Regimes under International Law. Cambridge University Press. p. 62. ISBN 9781139496179. Tensions escalated again in July 1974, following a coup d'état by Greek Cypriots favouring a union of Cyprus with Greece. In response to the coup, Turkey invaded Cyprus. ^ Bryant, Rebecca; Papadakis, Yiannis (2012). Cyprus and the Politics of Memory: History, Community and Conflict. I.B.Tauris. p. 5. ISBN 9781780761077. In response to the coup, Turkey launched a military offensive in Cyprus that divided the island along the Green Line, which now splits the entire island. ^ Diez, Thomas (2002). The European Union and the Cyprus Conflict: Modern Conflict, Postmodern Union. Manchester University Press. p. 105. ISBN 9780719060793. Turkey did, however, act unilaterally in 1974, in response to a military coup in Cyprus instigated by the military junta ruling then in Greece with the apparent objective of annexing the island. ^ Ker-Lindsay, James; Faustmann, Hubert; Mullen, Fiona (2011). An Island in Europe: The EU and the Transformation of Cyprus. I.B.Tauris. p. 3. Divided since 1974, when Turkish forces invaded in response to a Greek led coup, many observers felt that taking in the island would either be far too risky or far too problematic. ^ Mirbagheri, Faruk (2009). Historical Dictionary of Cyprus. Scarecrow Press. p. 43. ISBN 9780810862982. On 20 July 1974, in response to the coup and justifying its action under the Treaty of Guarantee, Turkey landed forces in Kyrenia. ^ Gray, Christine (2008). International Law and the Use of Force. Oxford University Press. p. 94. ISBN 9780191021626. ^ Taki Theodoracopulos (1 January 1978). The Greek Upheaval: Kings, Demagogues, and Bayonets. Caratzas Bros. p. 66. ISBN 978-0-89241-080-4. ^ Eric Solsten; Library of Congress. Federal Research Division (1993). Cyprus, a country study. Federal Research Division, Library of Congress. p. 219. ISBN 978-0-8444-0752-4. ^ "Turkey and the United States: The Arms Embargo Period". Praeger Publishers (5 August 1986). Retrieved 14 May 2010. ^ "Full list UN Resolutions on Cyprus". Un.int. Retrieved 29 January 2012. ^ Palley, Claire (18 May 2005). An International Relations Debacle: The UN Secretary-general's Mission of Good Offices in Cyprus 1999–2004. Hart Publishing. p. 224. ISBN 1-84113-578-X. ^ Xinhua (21 July 2006). "About 11,500 people flee Lebanon to Cyprus". People's Daily Online. ^ "Greek Cypriots dismantle barrier". BBC News. 9 March 2007. Retrieved 7 March 2008. ^ Hadjicostis, Menelaos (11 May 2015). "UN envoy says Cyprus reunification talks to resume May 15". Associated Press. Retrieved 24 May 2015. ^ a b c "Meteorological Service – Climatological and Meteorological Reports". ^ a b "Cyprus Climate Guide". Retrieved 5 June 2009. ^ a b "Met Office: Climate averages 1971–2000". Met Office. ^ a b Department of Meteorology. "The Climate of Cyprus". Archived from the original on 14 June 2015. Retrieved 8 August 2015. Statistical analysis of rainfall in Cyprus reveals a decreasing trend of rainfall amounts in the last 30 year[s]. ^ "EUROPA – The EU at a glance – Maps – Cyprus". Europa (web portal). Retrieved 27 March 2009. ^ "Dhekelia". Geosite.jankrogh.com. 30 January 2012. Retrieved 28 June 2013. ^ "CIA – The World Factbook – Cyprus". Cia.gov. 18 December 2008. Retrieved 6 January 2009. ^ "European Commission – Enlargement: Archives Country Profiles". Europa (web portal). Retrieved 6 January 2009. ^ Freedom in the World 2011 Report > Cyprus. Retrieved 28 June 2013. Also, page 29. ^ "Report of the Office of the United Nations High Commissioner for Human Rights on the question of human rights in Cyprus: 16th Session, Human Rights Council, United Nations" (PDF). Ohchr.org. 7 January 2011. Retrieved 14 February 2014. 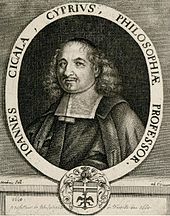 ^ Jean Christou. "US report raps Cyprus over battle on flesh trade". cyprus-mail.com. Archived from the original on 30 September 2007. Retrieved 13 October 2007. ^ Jacqueline Theodoulou. "A shame on our society". cyprus-mail.com. Archived from the original on 27 September 2007. Retrieved 13 October 2007. ^ Borger, Julian (12 May 2014). "European court orders Turkey to pay damages for Cyprus invasion". theguardian.com. Retrieved 8 April 2015. ^ Karadeniz, Tulay; Tokasabay, Ece (13 May 2014). "Turkey to ignore court order to pay compensation to Cyprus". Reuters. Retrieved 7 April 2015. ^ Kontorovich, Eugene (7 August 2014). "International Criminal Court action filed vs. settlements". washingtonpost.com. Retrieved 8 April 2015. ^ Yilmaz, Isilay. "TURKISH CYPRIOT CENSUS DEBATE FOCUSES ON NATIVES VERSUS "SETTLERS"". Wikileaks. US Department of State. Retrieved 11 June 2015. ^ a b Hadjisavvas, S. (2015). "Perishing Heritage: The Case of the Occupied Part of Cyprus" (PDF). Journal of Eastern Mediterranean Archaeology & Heritage Studies 3 (2): 128–140. Quote on p. 129: "the deliberate destruction of [Greek] heritage as an instrument toward the obliteration of an identity of a people in the framework of ethnic cleansing." ^ "New Cyprus army chief sworn in, Famagusta Gazette". ^ a b "Cyprus Economy". Republic of Cyprus. cyprus.gov.cy. Archived from the original on 2012-06-23. Retrieved 4 May 2007. ^ "Eurogroup Statement on Cyprus". Eurogroup. 25 March 2013. Retrieved 30 March 2013. ^ "Eurogroup signs off on bailout agreement reached by Cyprus and troika". Ekathimerini (Greece). 25 March 2013. Retrieved 25 March 2013. ^ Gilson, George (23 January 2011). "Something sizzling in Cyprus: gas shakes regional chessboard". Athens News. Retrieved 7 September 2011. ^ Ali, Jaber (15 July 2011). "Lebanese Cabinet discusses offshore energy policies". Middle East Confidential. Archived from the original on 2012-01-18. Retrieved 7 September 2011. ^ "Turkey may drill for oil and gas in Cyprus: Minister - ENERGY". ^ "Cyprus – Exclusive Economic Zone – Turkey's provocative behaviour". Republic of Cyprus. 10 August 2011. Retrieved 7 September 2011. ^ "'Don't attempt to test Turkey's past'". Hürriyet Daily News (Istanbul). 6 September 2011. Retrieved 7 September 2011. ^ Ament, Carol (19 August 2011). "Full speed ahead for Cyprus drilling". Famagusta Gazette. Retrieved 7 September 2011. ^ "Noble Energy: Good chance of large gas find off Cyprus". New Europe (newspaper). 20 February 2011. Retrieved 7 September 2011. ^ "Ankara threatens naval action over Cyprus' Block 12 drill". PanARMENIAN.Net. 6 September 2011. Retrieved 7 September 2011. ^ "Turkey's Miscalculation Over Cypriot Drilling". Stratfor News. 20 September 2011. Retrieved 12 June 2015. ^ "Growth in tourism has stimulated the property market in Cyprus". Property Abroad. apropertyincyprus.com. 10 November 2008. Retrieved 15 December 2008. ^ "New Incentives for Town Centres in Cyprus". Cyprus real Estate. urban-keys.com. 7 March 2014. Retrieved 11 October 2013. ^ "Immigration Permits for Investors in Cyprus". Cyprus real Estate. urban-keys.com. 7 March 2014. Retrieved 16 April 2013. ^ "World Bank Data: Motor vehicles (per 1,000 people)". The World Bank. Retrieved 27 August 2011. ^ "''Public Works Department official statistics''". Mcw.gov.cy. 24 March 2006. Archived from the original on 2012-03-26. Retrieved 25 October 2009. ^ "Cyprus By Bus". Cyprus By Bus. Retrieved 16 February 2011. ^ "The World Factbook – Ethnic Groups". Central Intelligence Agency. Retrieved 22 June 2013. ^ Boyle, Kevin; Sheen, Juliet (1997). Freedom of Religion and Belief: A World Report. Routledge. p. 288. ISBN 0-415-15978-4. ^ Salih, Halil Ibrahim (2004). Cyprus: Ethnic Political Counterpoints. University Press of America. p. 121. ISBN 0-415-15978-4. ^ Karoulla-Vrikki, Dimitra (2009). "Greek in Cyprus: Identity Oscillations and Language Planning". In Georgakopoulou, Alexandra; Silk, M.S. (eds). Standard languages and language standards: Greek, past and present. Ashgate Publishing. p. 188. ISBN 0-7546-6437-6. ^ Hadjipavlou, Maria (2002). "Cyprus: A Partnership Between Conflict Resolution and Peace Education". In Salomon, Gavriel; Nevo, Baruch (eds). Peace Education: The Concept, Principles, and Practices Around the World. Routledge. p. 195. ISBN 0-8058-4193-8. ^ St John-Jones, L.W. (1983). The Population of Cyprus: Demographic Trends and Socio-Economic Influences. London: Maurice Temple Smith Ltd. p. 17. ISBN 0-85117-232-6. ^ Cyprus Ministry of Interior (1992). "The Demographic Structure of Cyprus" (PDF). Parliamentary Assembly. p. 6. ^ Nicos, Trimikliniotis; Demetriou, Corina (2007). "Active Civic Participation of Immigrants in Cyprus" (PDF). POLITIS. p. 8. ^ "Census.XLS" (PDF). Retrieved 25 October 2009. ^ International Crisis Group (2010). "CYPRUS: BRIDGING THE PROPERTY DIVIDE". International Crisis Group. p. 1. ^ International Crisis Group (2010). "CYPRUS: BRIDGING THE PROPERTY DIVIDE". International Crisis Group. p. 2. ^ (n=65), Capelli, C.; Redhead, N.; Romano, V.; Cali, F.; Lefranc, G.; Delague, V.; Megarbane, A.; Felice, A. E.; Pascali, V. L.; Neophytou, P. I.; Poulli, Z.; Novelletto, A.; Malaspina, P.; Terrenato, L.; Berebbi, A.; Fellous, M.; Thomas, M. G.; Goldstein, D. B. (2006). "Population Structure in the Mediterranean Basin: A Y Chromosome Perspective". Annals of Human Genetics 70 (2): 207–225. doi:10.1111/j.1529-8817.2005.00224.x. PMID 16626331. ^ a b "Cyprus". The World Factbook. Central Intelligence Agency. Retrieved 9 February 2010. 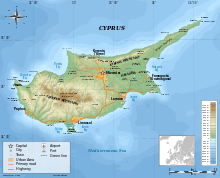 ^ "About Cyprus – Towns and Population". Government Web Portal – Areas of Interest. Government of Cyprus. Archived from the original on 2012-02-25. Retrieved 9 February 2010. ^ Solsten, Eric (January 1991). "A Country Study: Cyprus". Federal Research Division. Library of Congress. Retrieved 9 February 2010. ^ "Social values, Science and Technology" (PDF). Retrieved 25 October 2009. ^ Bowen, George E. (3 April 2001). "Assessing the Isle of Cyprus". Patrick S. O'Brien on the University of Tennessee server. Retrieved 12 November 2006. Three historic churches and monasteries are within the city. Just outside the city is the location of the Hala Sultan Tekke Mosque, the third holiest place for Muslims in the world. ^ Drayton, Penny (January 1993). "Aphrodite's island". Wood & water 2 (41). Cited by: Trubshaw, Bob (February 1993). "The Black Stone – the Omphalos of the Goddess". Mercian Mysteries (14). Retrieved 12 November 2006. In Cyprus is another highly venerated Islamic site – the third most important after Mecca and Medina – the Hala Sultan Tekke. ^ "Hala Sultan Tekke: Where East meets West", UNDP-ACT in Cyprus newsletter, Spring 2006. Retrieved 28 June 2013. ^ "Implementation of the Charter in Cyprus". Database for the European Charter for Regional or Minority Languages. Public Foundation for European Comparative Minority Research. Retrieved 20 May 2013. ^ Ammon, Ulrich; Dittmar, Norbert; Mattheier, Klaus J.; Trudgill, Peter, eds. (2006). "Greece and Cyprus". Sociolinguistics: an international handbook of the science of language and society / Soziolinguistik: ein internationales Handbuch zur Wissenschaft von Sprache und Gesellschaft. Handbooks of linguistics and communication science / Handbücher zur Sprach- und Kommunikationswissenschaft 3 (2nd ed.). Berlin: Walter de Gruyter. pp. 1881–1889. ^ a b c European Commission, Directorate-General for Education and Culture, ed. (2006). Euromosaic III: Presence of regional and minority language groups in the new member states. Brussels: Office for official publications of the European communities. pp. 19–23. ISBN 92-79-01291-6. Retrieved 8 August 2015. ^ Mejer, Lene; Boateng, Sadiq Kwesi; Turchetti, Paolo (2010). "Population and social conditions" (PDF). Statistics in Focus (49/2010). eurostat. ^ Europeans and their Languages, Eurobarometer, European Commission, 2006. ^ Fong, Mary; Chuang, Rueyling (2004). Communicating Ethnic and Cultural Identity. Rowman & Littlefield. p. 286. ISBN 9780742517394. ^ Patrick R. Hugg (November 2001). "Cyprus in Europe: Seizing the Momentum of Nice". Vanderbilt Journal of Transnational Law. Retrieved 26 March 2011. ^ "Lemba Archaeological Research Centre". Arcl.ed.ac.uk. Archived from the original on 2013-01-17. Retrieved 25 October 2009. ^ "Schools Out". . September 2006. ^ "Manifesta no more". .
^ Rhythm: Global Sounds and Ideas 9 (6–11). World Marketing Incorporated. 2000. p. 70. We have a Euro Music category with clips by the Gipsy Kings and Anna Vissi, a huge star for Sony Greece "We also have ..
^ "Cyprus Stamp Issue: Loukis Akritas". ^ "Cyprus Stamp Issue: Cyprus Poets". ^ "Cyprus Stamp Issue: Centenary Birthday Anniversary of Poet Pavlos Liasides". ^ "Film Birth – History of Cinema – Cyprus". ^ Robinson, R. K. – Tamime, A. Y. (1991). Feta and Related Cheeses. Woodhead Publishing. p. 144. ISBN 1-85573-278-5. Halloumi is a semi-hard to hard, unripened cheese that traditionally is made from either sheep's or goat's milk or a mixture. Although the cheese has its origins in Cyprus, it is widely popular throughout the Middle East, and hence many countries have now become involved with its manufacture. ^ Goldstein, Darra – Merkle, Kathrin – Parasecoli, Fabio – Mennell, Stephen – Council of Europe (2005). Culinary cultures of Europe: identity, diversity and dialogue. Council of Europe. p. 121. ISBN 92-871-5744-8. Most culinary innovations in the Cypriot cuisine occurred during the Byzantine era ... Experimentation with dairy products resulted in the now-famous halloumi and feta cheese. ^ "Turks riled as Cyprus set to win EU trademark on Turkish Delight". International Herald Tribune. Associated Press. 13 December 2007. Archived from the original on 2008-12-02. Retrieved 14 December 2007. ^ "Cyprus Badminton Federation". Cyprusbadminton.com. Retrieved 27 March 2009. Hannay, David (2005). Cyprus: The Search for a Solution. I.B.Tauris. ISBN 1-85043-665-7. Mallinson, William (2005). Cyprus a Modern History. I.B.Tauris. ISBN 1-85043-580-4. O'Malley, Brendan and Ian Craig (1999). The Cyprus Conspiracy. I.B.Tauris. ISBN 1-86064-737-5. Papadakis, Yiannis (2005). Echoes from the Dead Zone: Across the Cyprus Divide. I.B.Tauris. ISBN 1-85043-428-X. Yiorghos, Leventis, (2002). Cyprus: The Struggle for Self-Determination in the 1940s. Peter Lang. ISBN 0-8204-5428-1. Yiorghos, Leventis, Murata Sawayanagi Nanako, Hazama Yasushi (2008). Crossing Over Cyprus. Research Institute for Languages and Cultures of Asia and Africa (ILCAA) Tokyo University of Foreign Studies (TUFS). ISBN 978-4-86337-003-6. This page was last modified on 5 September 2015, at 00:20.